Clever Soiree: My First Stylish Blogger Award! 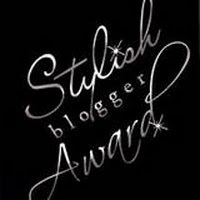 My First Stylish Blogger Award! Thanks to the ladies of http://purplepeepstechniques.blogspot.com/ I just received my first Stylish Blogger Award. To share, it's being passed on to others I admire and appreciate. Each new recipient should pass on the good wishes to their favorites along with answering 8 things about themselves in a blog post. 1. I love the smell of fresh paper, I can even pinpoint when this love was first born. When I was a child my grandfather worked as an Accountant in an office adjacent to the supply area and the smell of paper reams was intoxicating to me. I LOVE it to this day. 2. My craft supplies have a tendency to overtake the entire house but my scrubby is still very patient with me. 3. I started a business on the backbone of my love for creating cards and favors which is slowly getting off the ground. 4. My dream job would be designing art tools, stamps and technology for artists. 5. By day I am a techie geek that does web presentations and fiddles with Health Care Reform, by night I'm covered in glitter (no I'm not a part time stripper). 6. I still have my acrylics from college, can't bear to throw them out although the tubes look like they've been pulled out of a time capsule. 7. I am LOVING designing for craft companies, highlighting products and providing my opinion has really revived my mojo. 8. My basic designs tragedy is to pick 2 base colors and 1 accent then pull coordinating embellishments. 1. http://thehandmadecardblog.wordpress.com/ - Sarah is a wiz at card making, check her out! 2. http://graphicsfairy.blogspot.com/ - all things image related couldn't have done many of my projects without you! 3. http://sizzixblog.blogspot.com/ - Ideas GALORE, need I say more? 4. http://www.obsessedwithscrapbooking.com/ - Everything Cricut, coupons and sneak peeks! 5. http://lindystampgang.blogspot.com/ - everything shinny and new! 6. http://lifeandtimesofallyson.blogspot.com/ - Allyson is the stick pin queen, just take a look. 7. http://lifeasascrapbooker.blogspot.com/ - Amy has a great sense of style. 8. http://cherry-tink-ink.blogspot.com/ - Trina, the 2011 edition!